Begun in 2005, a work of fiction in black and white showing a man sleeping peacefully, his bare chest heaving and falling to the rhythm of his breathing. The video lasts 6 hours. Mounir Fatmi has chosen to represent a contemporary icon, the writer Salman Rushdie. The film borrows its imagery from the film “Sleep”, in direct reference to Andy Warhol’s minimalist pop experimental film in 1963, it shows 6 hours continuous image of the poet John Giorno sleeping. John Giorno sleeping in front of Warhol’s camera, in its literary context and controversy, is necessary and paradoxical. Sleep Al Naim suggests the ambivalence of a physical abandonment, quiet and calm. Considering the threats to his life since the publication of his novel “The Satanic Verses” in 1988, drifting off to sleep is a way for Salman Rushdie to put himself in a vulnerable position. But at the same time, this moment of unconsciousness expresses strength and confidence: the sleep of the just. For the artist, it is the creation of a face, a body, a presence, and certain goodness in the action. Creating from scratch the character of Salman Rushdie and staging the sleeping. Associate the own breathing body of the writer. Mounir Fatmi (MA), born 1970, constructs visual spaces and linguistic games that aim to free the viewer from their preconceptions of politics and religion, and allows them to contemplate these and other subjects in new ways. His videos, installations, drawings, paintings and sculptures bring to light our doubts, fears and desires. They directly address the current events of our world, and serve to both clarify the origins and symptoms of global issues, as well as speak to those whose lives are affected by specific events. 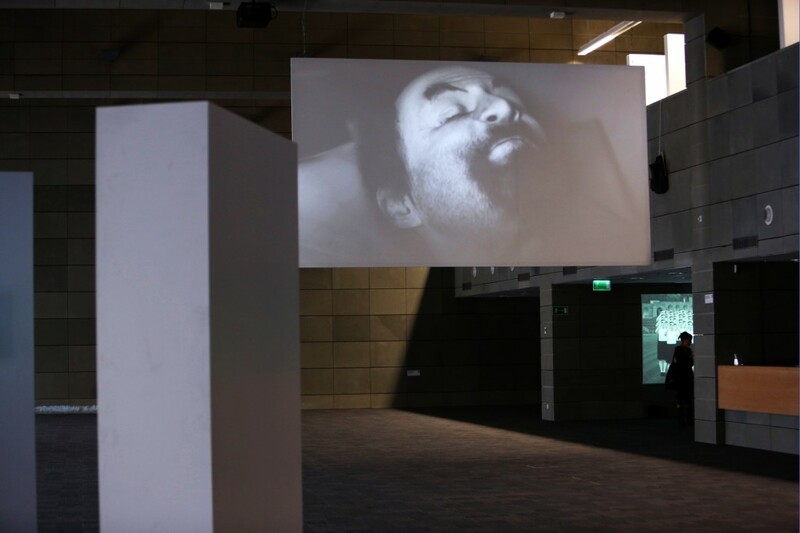 Mounir Fatmi’s work has been exhibited in the Migros Museum für Gegenwarskunst, Zürich, Switzerland, the Museum Kunst Palast, Düsseldorf, Germany, Centre Georges Pompidou, Paris, France, and the Mori Art Museum in Tokyo Japan. He also recently participated in the Gwangju Biennial, Korea, and the 2nd Seville Biennial, Spain. In 2006, he was awarded the Grand Prize at the 7th Dakar Biennial and Uriöt prize, Rijksakademie van beeldende kunsten, Amsterdam. His work was included in the 1st Luanda Triennial in Angola (2007), 8th Biennial of Sharjah and the 52nd biennial of Venice. In 2008, he is part of the program Paradise Now! Essential French Avant-Garde Cinema 1890-2008 at the Tate Modern in London. He participates in the exhibition Flow, at the Studio Museum Harlem, in New York and at the exhibition Traces du Sacré, at the Centre Georges Pompidou, in Paris. In 2009, he is present at the 10th Biennial of Lyon.